The Philatelic Bureau of the Department of Posts has issued four new postage stamps in the denominations of Rs. 10.00, Rs. 15.00, Rs. 35.00 and Rs. 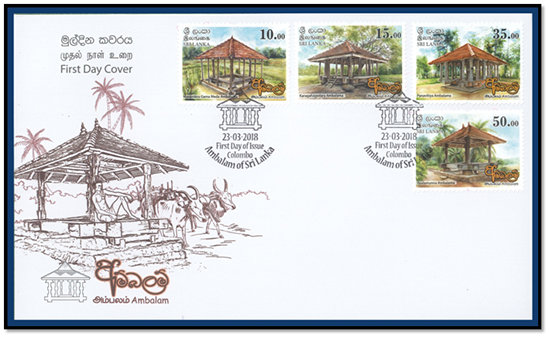 50.00 depicting Ambalam or Way-side shelters in of Sri Lanka and a Miniature sheet in the denomination of Rs. 110.00 on 23rd March, 2018. Although the exact period of time when the ambalam came into being in Sri Lanka cannot be stated with any certainty, it is revealed from the ancient information available on them that they were erected in the past not only as resting places for way-farers but also for use as places of assembly. The concept of rests-halls is not something confined to Sri Lanka alone. It was in use in the Asian as well as the western countries from the ancient times. There are references in the inscriptions erected by Emperor Asoka of India that he too had built such way-side shelters or ambalam. In the past ambalam were built within a distance of two or three miles from main roads and therefore it is possible to gather information on the ancient road system also according to the location of such rests. In many ancient villages it was possible to see two or three ambalam which were used by state officials to administer justice, collect taxes and for various other official purposes. Since it was the centre where traders coming from various parts of the island were used to meet one another, it can also be identified as a place of communication where news on various happenings in the country was discussed. 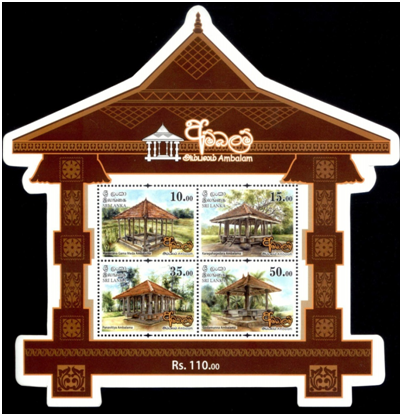 Many ambalam were constructed in a decorative manner. Since the Buddhist believed that the erection of ambalam for people travelling on foot and in palanquins to spend their time and rest was a highly meritorious act, it appears that the Buddhist approach figures prominently in this concept. Four such ambalam which are unique among those found in Sri Lanka, i.e. the Marassana welameda ambalama, Karagahagedara ambalama, Panavitiya ambalama and Godamunna ambalama are depicted in this series. This ambalama is situated half a mile off the main road opposite the main hospital of Marassana to the right from Marassana town on the Thalathu Oya – Hanguranketha road at Patha Hewaheta in the Kandy district. Situated in the middle of an extremely scenic tract of paddy field, it is mounted on a platform consisting of four large wooden logs. This platform which is about 6 feet in diameter is built on four blocks of stone placed on the four directions. There is another platform outside the inner platform which is made of timber logs about 3 feet in length. It can be considered as a space made for resting the feet after seating on the main platform or plank. Villagers say that the seat (log of timber) on the right was reserved for high caste people. Three of the main timber posts on the four corners with decorative carvings are decorated with very beautiful creepers designs, mat designs and male and female dancers. However, only one pillar is carved sparsely and according to legends, the pillars with carvings on them belonged to another ambalama which were found floating in a flooded stream. It is believed that the pillar carved sparsely was made subsequently to fill the gap. The carvings can be considered as those belonging to the Kandyan period. This ambalama is situated in the Karagahagedara village which is reached after travelling 02 miles on the Weerambugedara road turning right at Kalugamuwa on the Kurunegala-Negombo main road. It is built connected to the road leading to the old city of Panduvasnuwara. This ambalama which is among the artistic and ancient ambalam remaining in Sri Lanka at present, is situated on a beautiful rocky surface in a paddy field in a scenic setting. It looks simple on the face of it and yet is extremely attractive. It is constructed on a platform of timber beams placed on four stones. The roof rests on carved wooden pillar caps and is covered with flat tiles. There are 21 rafters in the king-post (kurupava) connected to the ridge-pole (keni-mandala). Carved on the third cross beam placed above are the words “In the saka year of one thousand and fifty nine or 1837 A.D.” Due to its location this ambalama adds beauty even to the surrounding environment of the area and it can be stated that it reflects the artistic tastes and thoughts of the contemporary society. This ambalama is situated in the village of Panavitiya in the Mayuravati Korale of the Devamedi-hatpatthuva of the District of Kurunegala. This attractive ambalama situated in the middle of a paddy field in a beautiful setting can be seen in the village of Panavitiya which can be reached after travelling about 3 miles on a gravel road turning left at the Metiyagane junction which is on the right of the town of Narmmala on the Dambadeniya – Anuradhapura road. It is mentioned in the Archaeological Report of 1961 that the roof of this ambalama had been thatched with straw and many of the carved logs had been decayed. However, a fairly good number of carvings which bear ample testimony to the craftsmanship of the ancient Sinhalese wood carver had been preserved in a reasonably good condition. It was Mr. Charles Godakumbura who took the initiative to conserve it. The Department of Archaeology has restored it to its original form and by today, some of its pillar caps can be seen in a simpler form than they were in the past. According to the 1962-63 Administrative Report of the Department of Archaeology, it was restored in that manner with plain carvings since it would take a longer time to replace the decorative carvings and more expensive to replace them in the original form. Therefore, it is essential for anyone who undertakes a study of the wood carvings of this ambalama to refer to the Archaeological Administrative Report. Panavitiya ambalama is the best example of its type in Sri Lanka with the highest number of exquisitely carved wood work which reflect the foremost and the most excellent techniques of wood carving. It is believed that this ambalama was erected in the 18th century or earlier. This ambalama is situated in the village of Godamunna in Patha-Hewaheta area of Gandahe Korale in the District of Kandy. It is seen about 04 miles away towards the right from the 1st mile post on the Thalathu-oya - Hanguranketha road. The roof of the ambalama is made by fixing wooden posts on a platform made using large wooden beams. All the wooden posts fixed on it are carved beautifully. However, many of the carvings have been destroyed as a result of being peeled off with knives. Although its dating cannot be established with certainty, according to legend, it is believed that the wooden posts of the palace burnt down by the Dutch in the 17th century were used for erecting this ambalama. According to yet another legend, it is stated that when the sacred Tooth Relic which was in Kandy was being carried for safe keeping, as the time for the offering of the mid-day alms was approaching, the meal was kept at this ambalama and offered to the Tooth Relic. This area was captured by the British during the anti-British riots in 1818 and this ambalama was used by the British army as butchery where cattle were slaughtered. It was restored during 1967-68 by the Department of Archaeology and the decayed wooden members were replaced with new wood. The tin sheets used for the roof were removed and replaced with decorated short flat tiles used during the Kandyan period. Godamunnaambalama can be identified as a fairly preserved old and artistic archaeological monument situated in the District of Kandy. All rights received. All right to identify the Department of Posts as the Author and designer of this Bulleting has been asserted in accordance with the Copyright, Design and Patents Act 1988.No part to this publication may be reproduced, stored in or introduced into a retrieval system, or transmitted in any form or by and means (electronic, mechanical, photocopying, recording or otherwise) without the prior permission from the publisher. Any person who does and unauthorized act in relation to this publication may be liable to criminal prosecution and civil claims for damages.